Overhead view of the Arkema plant in Corsby, Texas. Process stakeholders have concerns and responsibilities regarding operational safety, environmental impact, profitability, and more. At almost every level, the risk of loss, damage, or disaster is scrutinized and evaluated. Steps may be taken to prevent or reduce the impact of some negative event. Other risk reduction methods might be put into play to provide relief from losses suffered. Whatever the case, it is safe to say that much industrial effort is invested in predicting a broad range of "what if" scenarios. The recent events at the Arkema chemical plant in Crosby, Texas bring to light the limitations we, as process operators of any type, may put on our own thinking and actions. 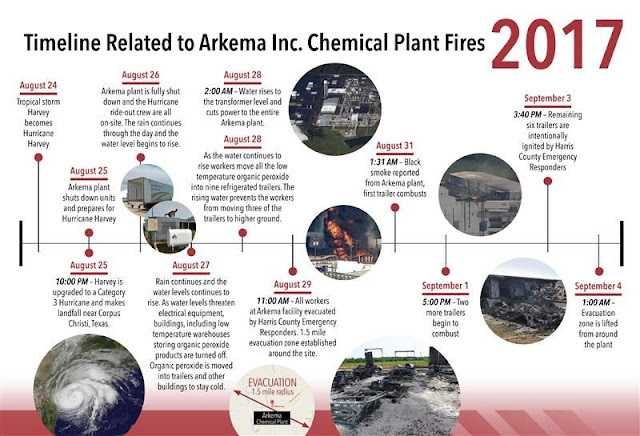 Though investment was made, and was ongoing, to improve aspects of the plant, the operation was still brought to a standstill and a fire ensued that brought the involvement of the US Chemical Safety Board. This resulted because natural events that were likely deemed impossible became reality, with insufficient contingency operations in place to handle the situation. What is important about the event is what we can all learn from it, what we can use to modify and improve our own methods of evaluating risk and implementing protections to prevent loss and damage. Essentially, the plant was overwhelmed by storm induced flooding that was unprecedented. Grid and backup power sources were rendered inoperable and material that required refrigeration to maintain a safe condition no longer was provided with the needed cold storage environment. The relationships between an operation and its surrounding environment are not static. The probability of any event occurring is never zero. When probabilities are perceived as being very small, they might be ignored, but low probability events can and do eventually become part of the plant environment. Developing strong contingency plans and incorporating design elements into an operation that account for events that seem impossible, but are actually of very low probability, is a good industrial practice that hardens the process or facility against disaster. Share and discuss your concerns and plans with process instrumentation and control specialists, leveraging your own knowledge and experience with their resources to develop a better solution.